A new high in lowbrow entertainment! "Planet X-Press Men" is the eighth comic issue, which was released 27 March, 2002 in the US. An advanced robot named Benderine (Bender) arrives, dying, at Planet Express. Professor F has his mutants bring him inside. The Professor re-fuels Benderine and asks him to stay on for some testing. It is determined that Benderine was created by their arch-enemy, Momneto but they ask him to train with the team, against Uniclops (Leela)'s wishes. Benderine makes the team and eventually gains the trust of Uniclops. The Mayor holds a ceremony honouring the Planet X-Press Men, but Momneto attacks and overpowers the team. Fry wakes up to find out it was a dream and the crew fight off the Electric Boogaloo Gang using methods similar to their counterparts in Fry's dream. Fry, Leela and Bender become actual super heroes in "Less than Hero". The cover design imitates a comic that is in a sealed in a plastic bag. The tag indicates that the comic contains the death of Flexo and the first appearance of Scruffy-Doo. Neither of these are true. Unlike the actual X-Men, the powers were received from experimentation rather than genetics. 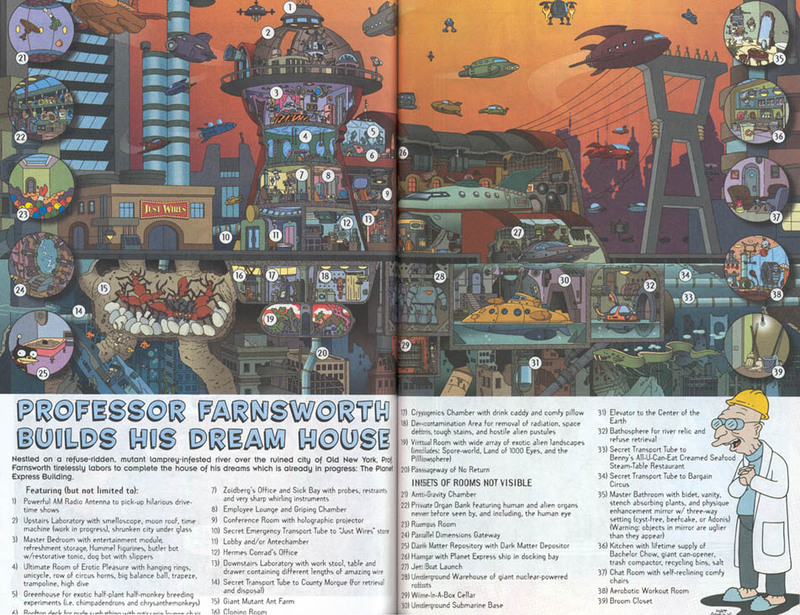 Issue #70 is titled "The Devil and Professor F.". Amy / Rouge: Schlick! I'm absorbing Lobstrocity's powers! And oh my god, am I starving! Zoidberg / Lobstrocity: It's not just an act, people. Hermes / Weather Mon: You're not paralyzed?! Professor: Of course not! I'm just lazy! Off I go! This is a parody of the X-Men with the crew playing the roles of some major mutants. These are indicated below. 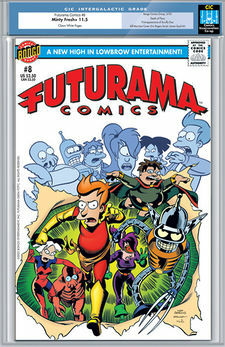 The comic book cover for this Futurama comic is a parody of the cover for the first Giant-Size X-Men issue that was released in May 1975. 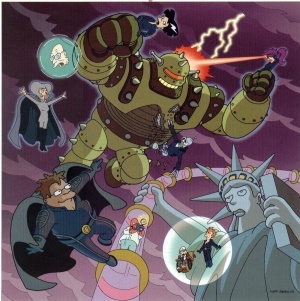 One unique difference is that while the cover for the Futurama comic was meant to portray the character and their superhero alter-egos, the X-Men version was meant to show the original X-Men team at the top and the newly introduced second generation X-Men team at the bottom, to which most of new characters would at the time become the new X-Men team along with Cyclops. Scruffy-Doo is probably a parody of Scrappy-Doo. On the title page, Bender is seen reaching out with his left hand, it has four digits instead of the usual three. This page was last edited on 9 April 2014, at 04:08.